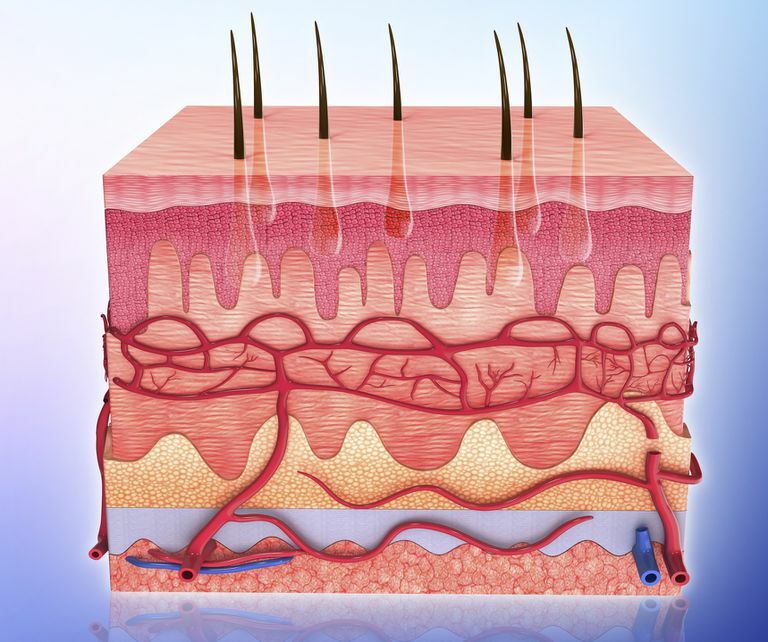 Subcutaneous tissue, which is also known as the hypodermis, is the innermost layer of skin. It's made up of fat and connective tissues that house larger blood vessels and nerves, and it acts as an insulator to help regulate body temperature. The thickness of this subcutaneous layer varies throughout the body and also from person to person. The hypodermis is largely composed of adipose tissue (fat tissue), which is made up of adipocytes, or fat cells. The amount of adipose tissue varies throughout the body. It is thickest in the buttocks, the palms of the hands, and the soles of the feet. The size of adipocytes is determined by an individual's nutritional habits. Generally speaking, a person that maintains a healthy diet and exercise habits has smaller adipocytes and is less likely to be overweight. The location and thickness of subcutaneous tissue differ by gender. Men tend to accumulate more around the abdomen and the shoulders, while women tend to accumulate it around the thighs, the hips, and the buttocks. The epidermis' adipose tissue acts as an energy reserve. Once the body uses up energy that's acquired from consuming carbohydrates, it turns to adipose tissue as a fuel source, which can lead to weight loss. Adipocytes can swell or shrink depending on whether the fat is being stored or used. The hormone leptin is secreted by fat cells to help control appetite and signal when you are full. Additionally, this fat acts as "armor" that protects muscles, bones, organs, and more delicate tissues. Think of subcutaneous tissue as the protective gear that athletes such as football and ice hockey players wear. It's the body's natural padding, cushioning and protecting your bones and muscles if you fall or take a hit. Subcutaneous tissue also regulates body temperature by making sure that your internal temperature isn't too high or too low. The hypodermis essentially insulates the body, allowing you to go outside on a cold day without getting hypothermia (a dangerous condition that, if allowed to go on for too long, can result in freezing to death). As you age, subcutaneous tissue starts to thin out. This weakened layer of insulation makes the body more sensitive to the cold because less tissue makes it harder to stay warm. The loss of subcutaneous tissue due to aging also causes the body to sweat less, which, in turn, makes it harder to stay cool in warm weather. It can also affect the body's reaction to certain medications that are absorbed by subcutaneous tissue. While the hypodermis is not visible, it can have a dramatic effect on the appearance of the skin and the way aging impacts the skin, specifically in the area of the face and neck. With aging, the volume of facial fat decreases and there is less supportive tissue to support the normal elasticity of the skin. The facial skin begins to droop and sag; the bones and muscles of the face also lose volume. Some people may choose to receive chemical cosmetic fillers to "plump up" the skin in these areas. Facial Fillers: Do You Know the Differences? Aging Changes in the Skin. MedlinePlus. https://medlineplus.gov/ency/article/004014.htm. Subcutaneous (SQ) Injections. MedlinePlus. https://medlineplus.gov/ency/patientinstructions/000430.htm.